Petr Cech has been ruled out for up to four weeks with the hamstring injury he suffered in Arsenal’s win over Watford. The experienced goalkeeper had to be substituted early in the second half of Saturday’s 2-0 home victory . Bernd Leno came on to make his debut and will seek to impress coach Unai Emery as he eyes an extended run in the starting line-up. 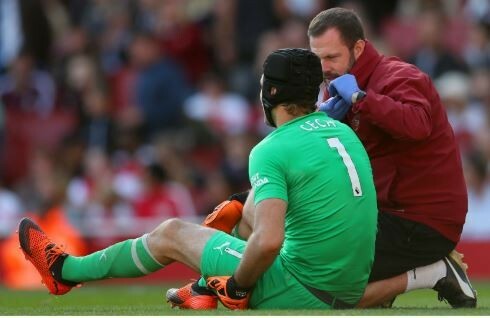 An update from Arsenal’s medical team on Tuesday confirmed Cech’s anticipated period of absence. “Expected to return to full training in three to four weeks,” the statement said of Cech’s hamstring injury. Arsenal added that Laurent Koscielny’s recovery from an Achilles injury is progressing well. The France centre-back, who missed the World Cup, could return to full training next month. The news will come as a blow to Emery, who had previously speculated that the former Chelsea man could miss as little as a fortnight . “I don’t know [when Cech will return now,” he told the media after the Watford game on Saturday. “We will look tomorrow. Emery’s men, who have won seven games in a row, face Europa League clashes with Qarabag and Sporting CP in October, along with Premier League matches against Fulham, Leicester City and Crystal Palace. Arsenal will also be active in the Carabao Cup over the course of a packed month, as they gear up for a fourth round clash at home to Blackpool.